New Year’s Eve is just two days away. On top of making celebratory plans and resolutions for 2016, pet owners need to make plans now to ensure their pet is safe during New Year firework displays. The 24 hour period from New Year’s Eve through to New Year’s Day is the busiest time of the year for the Home. During this time we are inundated with lost and anxious pets that have fled their homes in fear of planed and illegal backyard firework displays. On top of New Year’s Eve firework displays, Victorians are also bracing for another run of hot days and possible thunderstorms – which are common at this time of year. This means pet owners need to take extra care this week to keep their dog or cat safe. To help pet owners this week, we have put together some tips for pet owners to help keep their pet safe in the lead up to 2016. 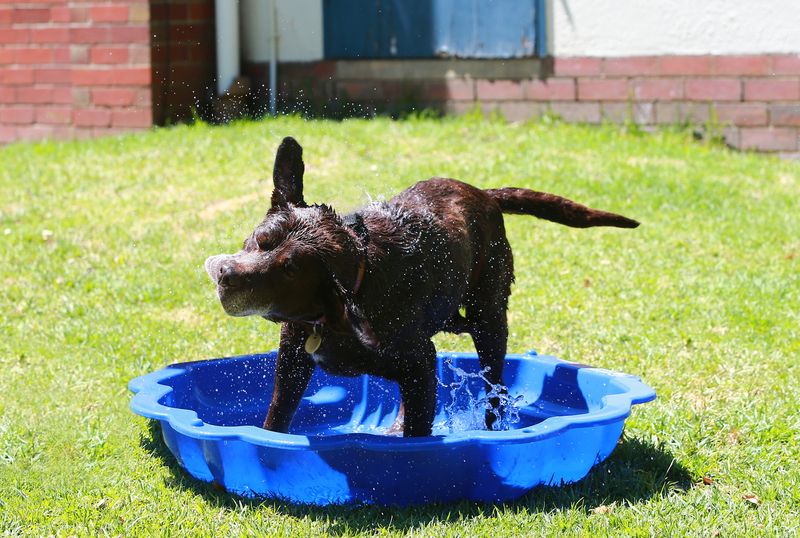 Ensure your pet has access to cool and clean drinking water. If you have a large dog, or if they have a habit of knocking their bowl over, use more than one bowl. Keep their water cool by using large ice blocks in water containers. If you have an outdoor pet, ensure they have easy access to shade and water throughout the day. Keep a note of the sun’s movement when you are not at home, and make sure your pet’s housing is in an area that gets constant shade. Exercise your dog in the early morning or late evening. Be mindful not to overexercise overweight or senior dogs. If you can, try and stay at home, or have someone at home with your pet to keep an eye on how they’re going, particularly those who are senior or are ill.
Never leave your pet in the car unattended. The consequence of leaving them in the car, however briefly, can be fatal. If you want more information about hot weather and your pet, check out our Heat Stress and Your Pet fact sheet, here. The Pets-A-Loud team caught up with Dr Trepheena Hunter, Animal Behaviour Manager at the Home, to get some helpful tips on how to keep pets calm during firework displays. Hit play on the audio below to find out more. Always make sure your pet is identified with a microchip and collar tag. Make sure your contact details are also up-to-date, so if they go missing, you will be reunited. For more tips on how to care for your pet during fireworks and thunderstorms, take a look at our Fireworks, Storms and Your Pet fact sheet, here. For up to date information on weather go to the Bureau of Meteorology.